Synchronicity was called by Carl Jung "an acausal connecting principle", "meaningful coincidence" and "acausal parallelism". One of Carl Jung's favorite quotes was from Alice through the Looking Glass by Lewis Carroll. My friend Nic took a picture of Rennes Chateau's floor design near the altar where Mary Magdalene kneels. Its a cubic design and Meandros Design. Thanks to Nic for bringing back such a great picture. Just hit the link to see the cubic design. The Meandros Design is above the cubes. The Meandros design is found all over the world such as China, Greece and Rome. It symbolizes eternal life, eternal friendship, and eternal love. It is the Meandros who is a river god and it symbolizes the ocean waves. Here is the Walden Hill crop circle. Notice the Meandros Design on the outside. 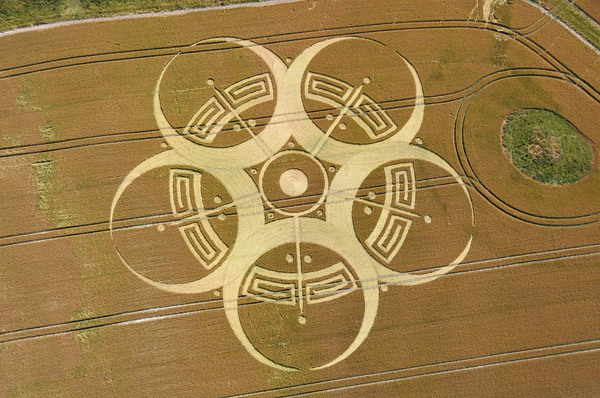 This design is on the floor at Rennes Chateau and the Meandros Design appears on the crop circle. It means a maze or labyrinth. In the legend of the Minotaur only the thread of Ariadne helps the hero find his way out and defeat the Minotaur. Meandros the river god meanders twist and turns like a maze. Some have said it's the underground water system that gives power to the Crop circle creations. The mysterious Rennes-Le-Chateau has many patterns on its floors. One is the black and white checkered pattern such as a checkerboard or chess board pattern, It's symbolic and used in Masonic temples, churches, and cathedrals. The black and white square tiles represent the interaction of light and dark. It is part of sacred geometry. It could represent the game of chess, which some believe may have come from extraterrestrials. President Kalymykia of the World Chess Federation believes that chess may have come from extraterrestrials long ago. The black and white squares on the floor represent one dimension where the cube like pattern illustrates another. I love Carl Sagan's lesson on the Tessuract. I noticed that some crop circles' sacred geometry brings up the cube. 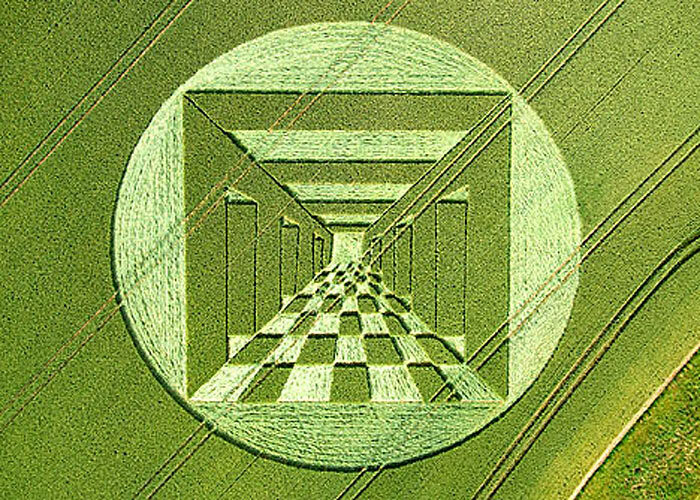 One of my favorite crop circle is the one that mimics a picture in the movie "Matrix" wherein Neo must pick the right door. In the picture the cube has a floor, which is checkered with dark and light squares. 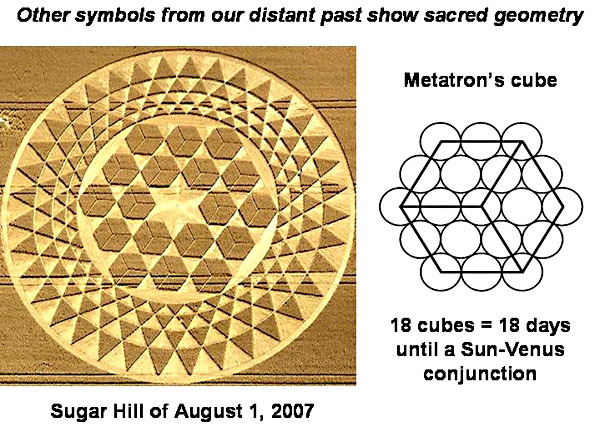 The Metatron Cube seems to have ended up a crop circle. The Metatron Cube is called in sacred geometry the Flower of Life. Metatron was the name of a great Archangel. The Metatron is a mysterious character in The Book of Enoch. Metatron has a connection to Thoth and the Emerald Tablets of Thoth. Thoth is the Egyptian god who created the alphabet, the sciences, and is mediator between the forces of light and dark. He is said to be responsible for the movement of the stars and planets. 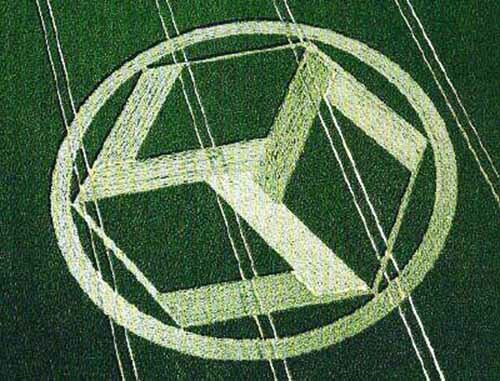 Here is another crop circle with the cubes and the Hebrew Star and could refer to the Megatron archangel of the heavens in the Book of Enoch. The Ark of the Covenant was made in the measurement of the cubit. A cubit was one of the first recorded measurements in history. It was used in the building of the pyramids. In the Ark of the Covenant was said to be the Tablets of Testimony. Did these tablets hold the knowledge of the heavens given to man by the ones from the heavens. Its fitting for the cube pattern on the mysterious Rennes Chateau floor. The Metraton cube is alchemy's mystery. The Metatron is the mysterious archangel who some say led the Israelites out of Egypt. He plays a part in the Tree of Life in the Kabbalah. It is the chess board of black and white squares. 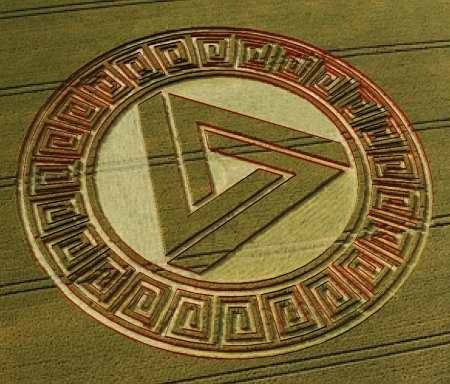 Crop circles are based many times on Sacred Geometry. They play with shadow and light . Man used to be the master of chess but now computers have been created that can beat the Masters. The computers have the math skills but do they have the soul of the game? It appears the mystery continues and perhaps the crop circles creators hold the answer to that mystery. Rennes Chateau might be a piece of this mysterious puzzle of the Metatron's cube. Is it coincidence or is it "synchronicity"? You make the next move?